people—those irrational and unpredictable beings—in the course of your work. And you’ll discover why playing well with others is at least as important as having great technical skills. 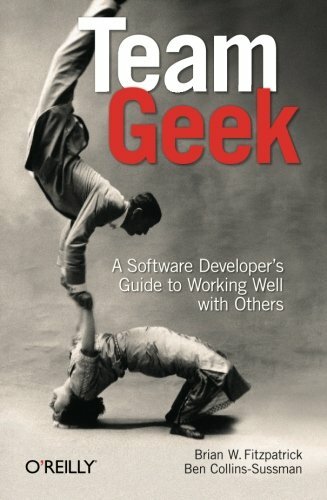 By internalizing the techniques in this book, you’ll get more software written, be more influential, be happier in your career. Brian Fitzpatrick leads Google’s Data Liberation Front and Transparency Engineering teams and has previously led Google's Project Hosting and Google Affiliate Network teams. He cofounded Google’s Chicago engineering office and serves as both thought leader and internal advisor for Google's open data efforts. Ben Collins-Sussman, one of the founding developers of the Subversion version control system, led Google’s Project Hosting team and now manages the engineering team for the Google Affiliate Network. He cofounded Google’s engineering office in Chicago and ported Subversion to Google’s Bigtable platform. Ben coauthored Version Control with Subversion, and contributed chapters to Unix in a Nutshell and Linux in a Nutshell.